Liquid Mask Tub Surface Protector creates up to a 40 mil latex protectant coating on hard to cover surfaces like showers, tubs, and whirlpools; protecting them from scratches, bumps and burns. Great for use on porcelain, enamel, fiberglass, acrylic and glass. May be applied either by airless sprayer or paint/roller. The most efficient application is by airless sprayer with a minimum of 2,500 psi. For maximum surface protection, two thin coats of application of Liquid Mask Tub Surface Protector are recommended. Available in 1 or 5 gallon containers. 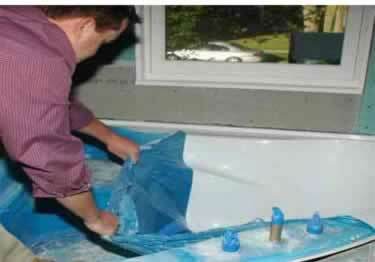 1 gallon of Liquid Mask Tub Surface Protector will cover two five foot tubs or about 70 sqft. For use on porcelain, enamel, fiberglass, acrylic and glass. Can I use this product on stainless steel? Liquid Mask Tub Surface Protector creates up to a 40 mil protective latex coating for hard to cover surfaces like showers, tubs, and whirlpools. This product did just what we needed it to. It was easy to apply and affordable. Guards all countertop surfaces from dirt, grime, & spills, excellent for laminated plastic, tile, vinyl, granite, & glass.